Description: In this example network is configured with EIGRP as routing protocol. Then run MPLS over the IP network to fast switch layer 2 interfaces. 6.Configures MPLS hop-by-hop forwarding on the interface. 4. Click enable ip cef. 7. Select MPLS ip and click save button and close button. 9. In the Interface Feature Edit dialog assign IP Address,Mask Address and Enable the interface status. Assign the loopback address as 172.16.1.1, mask as 255.255.0.0 and fastethernet 0/0 interface as 172.16.12.1 , mask as 255.255.0.0 and click OK button. 10. Click Router > Dynamic Routing > select EIGRP from the list and click Edit button. 11. In Edit IP dynamic routing enter Autonomous System Number as 1 and click add button. 12. Enter 172.16.0.0 as network number in Add a network winow and click OK button. 14. Click Router > MPLS. 16. Click Enable ipcef, Enable MPLS Protocol. 17. Select fa0/0 from interface drop down list ,click enable MPLS ip and click save button. 18. Select S0/0 from interface drop down list ,click enable MPLS ip and click Save button and Close button. 19. 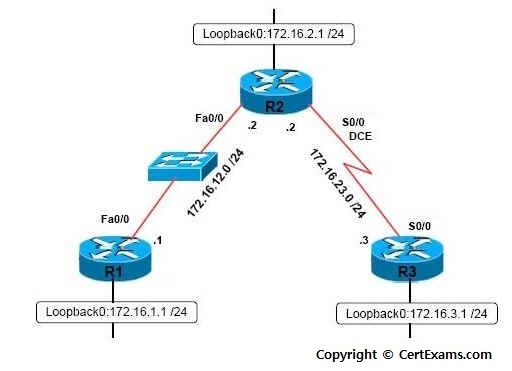 To configure ip address of R2 repeat steps 8-12. Loopback address of R2 is 172.16.2.1 255.255.0.0 and Fa0/0 address is 172.16.12.2 255.255.0.0 and s0/0 address is 172.16.23.2 255.255.0.0. 22. In Device properties window click MPLS tab. 23. Click Enable ip cef , Enable MPLS protocol. 24. Select s0/0 interface from interface drop down list , click enable MPLS ip and click save button and close button. 25. To configure ip address of R3 repeat steps 8-12 . The loopback address of R3 is 172.16.3.1 255.255.0.0 and S0/0 ip address is 172.16.23.3 255.255.0.0. 26. Select device R1 from select device drop down and choose View > IOS show commands from left navigation pane. 28. Also issue "show ip cef summary" from the drop-down box. 30. Click Utilities > Ping and Traceroute. 32. Click MPLS Ping button to view MPLS ping response. 33. Click Traceroute button to view traceroute response. 34. Click Traceroute MPLS button to view MPLS traceroute response.